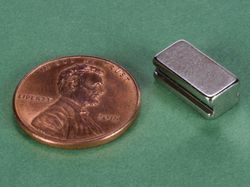 We are often asked how we separate large magnets. 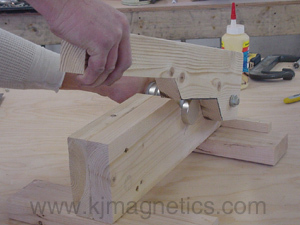 We have built several magnet separator tools over the years and have been continually improving the design. 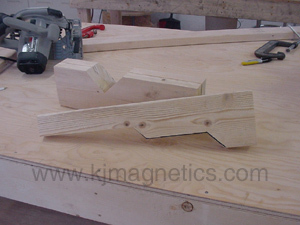 The tool is made out of wood and is fairly simple to build with only a basic woodworking knowledge. Here we will illustrate and explain the process of building such a tool. WARNING: Follow all safety procedures when working with and operating woodworking tools. This page is meant only as a guide and not as a step-by-step procedure. Observe all warnings and safety precautions with each tool. Read every users manual from front to back and memorize the part number for every replacement part of each tool before proceeding. DISCLAIMER: Any information posted on this site is as a public service. Users of this web site are responsible for checking the accuracy, completeness, currency and/or suitability of all information themselves. 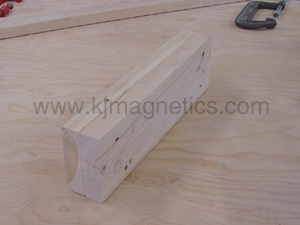 K&J Magnetics, Inc. does not represent, guarantee or warranty the accuracy, completeness, currency, or suitability of the information on this web site. K&J Magnetics, Inc. specifically disclaims any and all liability for any claims or damages that may result from providing the web site or the information it contains, including any web sites maintained by other parties and linked to this web site. This is what the finished tool will look like. The material and tools required to build it are pretty minimal. It is constructed out of standard 2x4's and 2x6's. 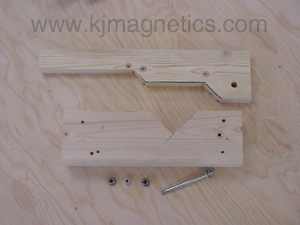 Here are the basic tools and materials needed to build your own magnet separator. 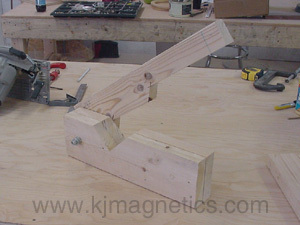 You will need about 6' of 2x6 and about 3' of 2x4 to build the separator as shown. The only other materials needed are screws (or nails) to fasten some parts together and a 1/2" diameter x 6" bolt with a lock nut and a few washers to act as the pivot for the lever arm. The basic tools needed are a saw for cutting wood, a drill for drilling the hole for the pivot bolt and possibly driving screws, wrenches for tightening the bolt and nut. A tape measure and square are handy, but not absolutely required. Start by cutting two 18" pieces of 2x6. 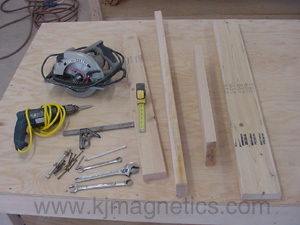 Place the two boards side-by-side and screw them together with four screws, one in each corner, about 1" from the edges. When finished, the pieces should look just like the picture to the left. This will be the body of the separator tool. Using a square, mark the piece to cut out of the boards as shown. 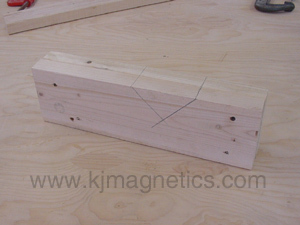 If you will be separating block magnets, it is advantageous if the 'V' is at a 90 degree angle. The center of the notch should be about 1/3 of the way from the back end of the boards (where the pivot bolt will go), and about 1/3 of the way through the 6" dimension of the 2x6's. Cut out the notch. A good 'ol hand saw will do just fine if you don't have the power tool access or power tool skills. Cut a piece of 2x6 to a length of 22-26". 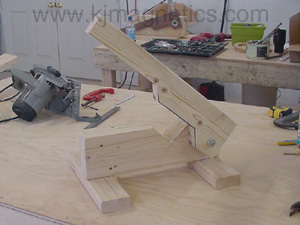 The lever arm works best if it is cut to three levels. The part of the board above the line will become our lever arm. The rightmost section will be where the pivot bolt goes through. The middle section will be the part that does the actual magnet separating, and the leftmost section will be the handle. 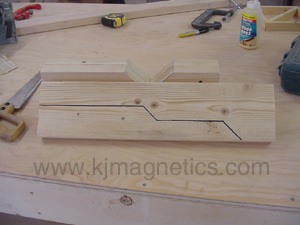 The easiest way to lay this out is to align the back of the lever arm board with the back of the body you built earlier. Then make a mark on the lever 1" on either side of the notch you cut. These marks will be where the middle section begins and ends. From there, you can draw rough diagonals as shown. Each step is about 1/3 of the 6" width. This is about what the lever arm should look like. This is the most critical part of the process. The hole in the lever arm should be about 1" from the back end, in line with the flat surface of the middle section of the lever arm. The hole in the body should also be 1" from the back end, but this should be aligned with the bottom of the cut out notch. When using the finished tool, this alignment of the holes will cause the magnets to separate just about when the lever arm is horizontal. We have found this to work best. Put the bolt through the holes in the body and lever arm. If you are right handed, the tool will be easier to use if the lever is on the right side as shown. If you are left handed, the lever should go on the left side. Tighten the bolt so the lever arm moves freely, but is snug to the body. A lock nut or double nut will keep the nut from loosening during use. Cut two pieces of 2x4 to 12-14" in length. Screw or nail them on to the bottom of the body as shown. You now have a functional magnet separator tool. 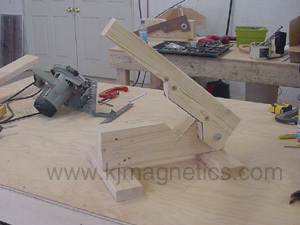 Hang one magnet under the lever as shown. 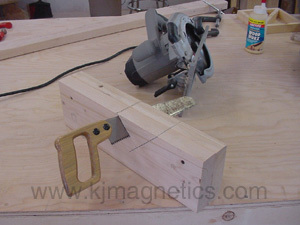 Use the lever arm to slide the magnet from the magnet(s) in the cut out notch. 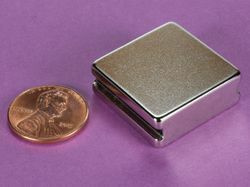 Be careful that the magnet being separated does not jump back towards the other magnets once it is free. A second person to catch the magnet is very helpful. Send us your pictures! If you build a magnet separating tool of your own, please send us a picture and/or describe any improvements you have made so we can share them with others.